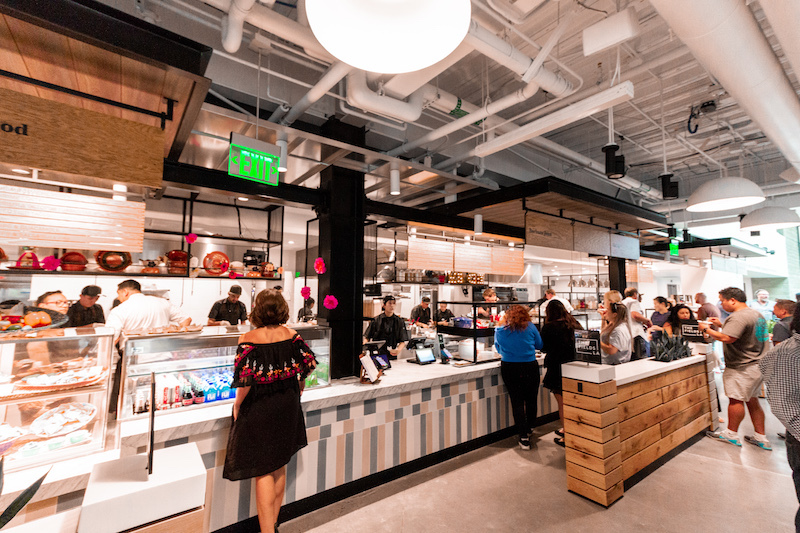 The Fields LA opens this Tuesday, August 14, billing itself as “a stylized urban food hall” as well as a celebration of Los Angeles’ culinary diversity. 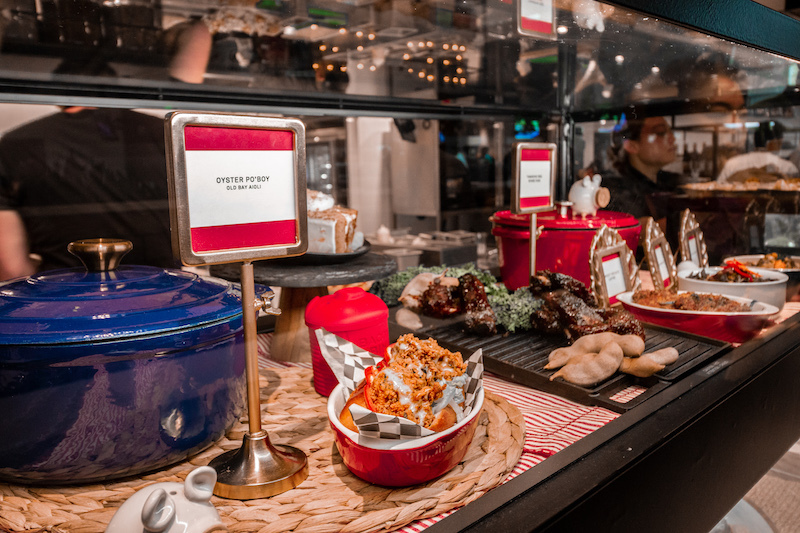 Situated in Exposition Park next to Banc of California Stadium — the recently opened home to Los Angeles Football Club — The Fields’ main floor will feature nine different vendors offering a variety of cuisines, plus two bars. Some of the city’s best chefs are part of the culinary team here. Tim Hollingsworth (Otium and Barrel & Ashes) helms C.J. Boyd’s Fried Chicken, which features five different chicken sandwiches and banana pudding. Jason Fullilove drops in a third location of his soul food restaurant Barbara Jean. 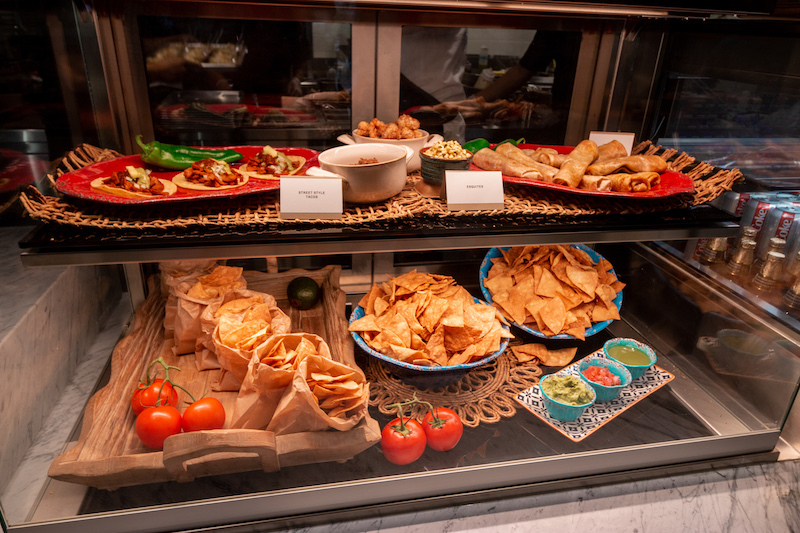 Other cuisines represented include Chinese-American, Middle Eastern, Italian, and Mexican (a burrito spot, Nayarit-style seafood, and a Mexico City-style taqueria). Open every day of the year except Christmas, this food hall isn’t just for soccer fans on game day. Developers are betting that the unique offerings, combined with the location (a stone’s throw from the USC campus and the nearby Expo Park Metro station) will make The Fields LA a year-round destination. The pricing — $10 for a top-quality gourmet chicken sandwich and $7 or $8 for many of the craft beers — is more accessible that you might expect from an operation of this scope. The size — seating for 200 inside and 90 at the outdoor cafe — is ambitious. During a press preview this past week I sampled some of the many offerings, and left impressed by more than a few standouts: short rib on a bed of smoked hummus dotted with pomegranate seeds at Akko Port; the K-Town chicken sandwich (laden with chili, ginger, cabbage, daikon, and sesame mayo) at C.J. Boyd’s; beef and sweet carrot potstickers and cheese foam oolong tea at Ms. Chi; mac and cheese studded with crawfish at Barbara Jean; tostaditas, heavy with shrimp and octopus, at Coni’Seafood; the birria quesadilla at Burritos La Palma. I also loved the focaccia sandwich with mortadella and parmesan crema at Piccolo Antico Pizzeria Focacceria, a pop-up that will be here for just three months. The drink menus include a well-curated array of wine, craft beer, and handmade cocktails from Nick Meyer and Julian Cox. The cocktails are exceptional, including two shockingly good frozen concoctions: a Mai Tai and the spicy, tequila-based Poblano Escobar. Also very good: the Strawberry Fields and a margarita, both served on tap. Tin City’s rosé cider is also a singular choice. The Fields’ second floor, expected to open as soon as September, will be home to Free Play, a new restaurant and bar from Hollingsworth, featuring bar bites, a full bar, live music, a DJ booth and games. The third floor, an expansive rooftop deck with impressive city views, will be available to rent as an event space. The Fields LA, is located at 3939 S. Figueroa. 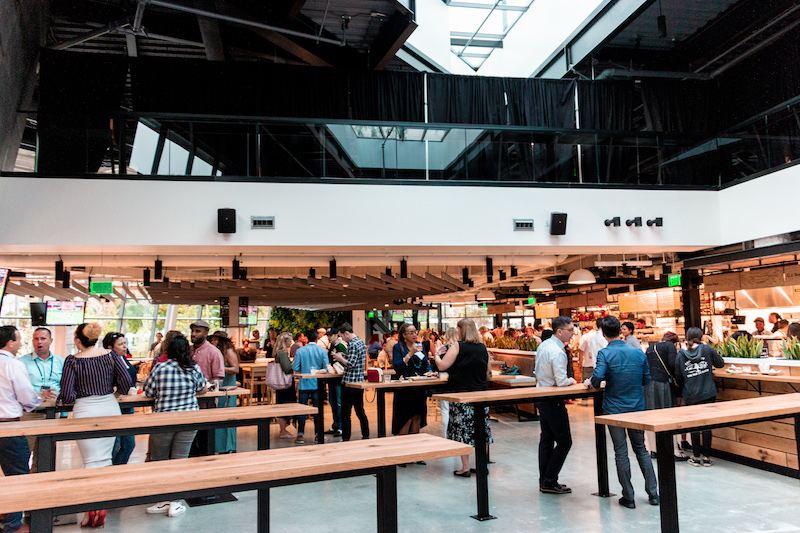 The food hall will be open daily from 11 a.m. to 10 p.m. starting August 14.